1 Data Virtualization Overview Take Big Advantage of Your Data "Using a data virtualization technique is: number one, much quicker time to market; number two, much more cost effective; and three, gives us much more agility in actually changing new models of customer programs." Martin Brodbeck, CTO Pearson Education Fast-changing business conditions require agility: a difficult challenge in your distributed on premises, big data, and cloud environments. Businesses that successfully use their data will be the leaders; those that do not will fall behind. 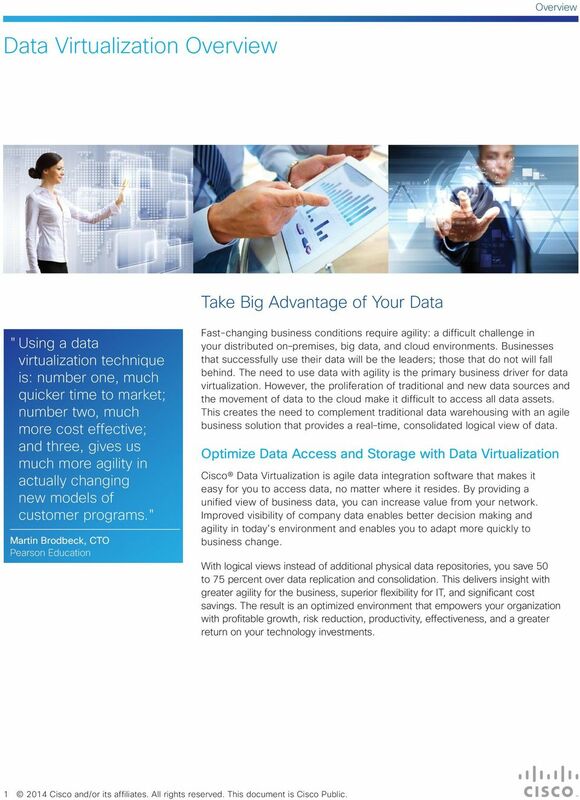 The need to use data with agility is the primary business driver for data virtualization. However, the proliferation of traditional and new data sources and the movement of data to the cloud make it difficult to access all data assets. This creates the need to complement traditional data warehousing with an agile business solution that provides a real time, consolidated logical view of data. 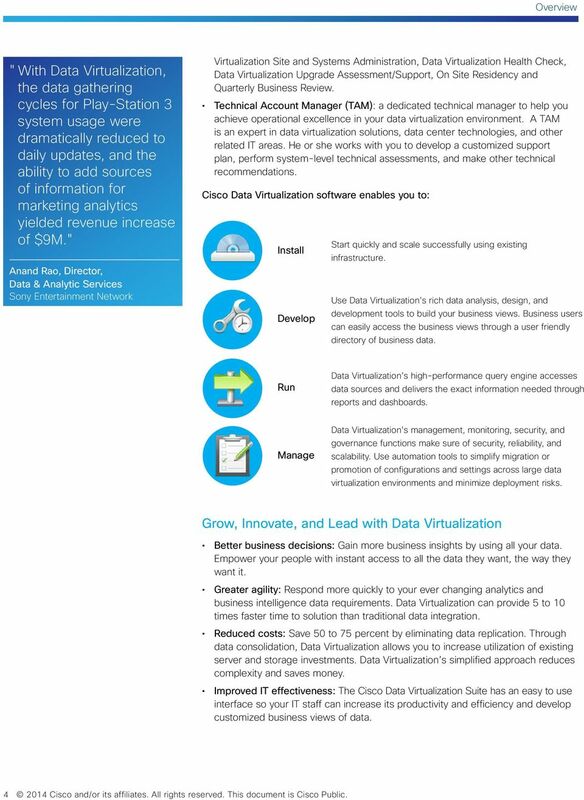 Optimize Data Access and Storage with Data Virtualization Cisco Data Virtualization is agile data integration software that makes it easy for you to access data, no matter where it resides. By providing a unified view of business data, you can increase value from your network. Improved visibility of company data enables better decision making and agility in today s environment and enables you to adapt more quickly to business change. With logical views instead of additional physical data repositories, you save 50 to 75 percent over data replication and consolidation. This delivers insight with greater agility for the business, superior flexibility for IT, and significant cost savings. The result is an optimized environment that empowers your organization with profitable growth, risk reduction, productivity, effectiveness, and a greater return on your technology investments Cisco and/or its affiliates. All rights reserved. This document is Cisco Public. 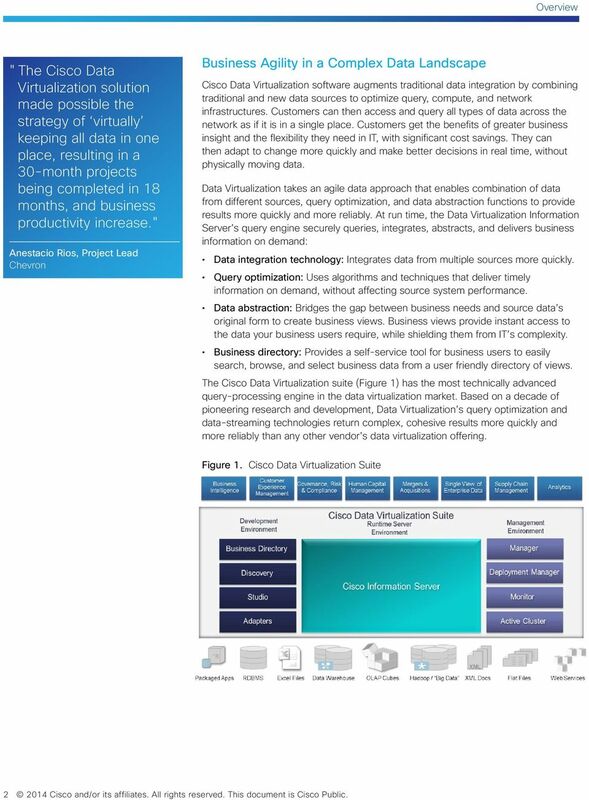 2 "The Cisco Data Virtualization solution made possible the strategy of virtually keeping all data in one place, resulting in a 30-month projects being completed in 18 months, and business productivity increase." Anestacio Rios, Project Lead Chevron Business Agility in a Complex Data Landscape Cisco Data Virtualization software augments traditional data integration by combining traditional and new data sources to optimize query, compute, and network infrastructures. Customers can then access and query all types of data across the network as if it is in a single place. Customers get the benefits of greater business insight and the flexibility they need in IT, with significant cost savings. They can then adapt to change more quickly and make better decisions in real time, without physically moving data. Data Virtualization takes an agile data approach that enables combination of data from different sources, query optimization, and data abstraction functions to provide results more quickly and more reliably. At run time, the Data Virtualization Information Server s query engine securely queries, integrates, abstracts, and delivers business information on demand: Data integration technology: Integrates data from multiple sources more quickly. Query optimization: Uses algorithms and techniques that deliver timely information on demand, without affecting source system performance. Data abstraction: Bridges the gap between business needs and source data s original form to create business views. Business views provide instant access to the data your business users require, while shielding them from IT s complexity. Business directory: Provides a self-service tool for business users to easily search, browse, and select business data from a user friendly directory of views. The Cisco Data Virtualization suite (Figure 1) has the most technically advanced query-processing engine in the data virtualization market. Based on a decade of pioneering research and development, Data Virtualization s query optimization and data-streaming technologies return complex, cohesive results more quickly and more reliably than any other vendor s data virtualization offering. Figure 1. 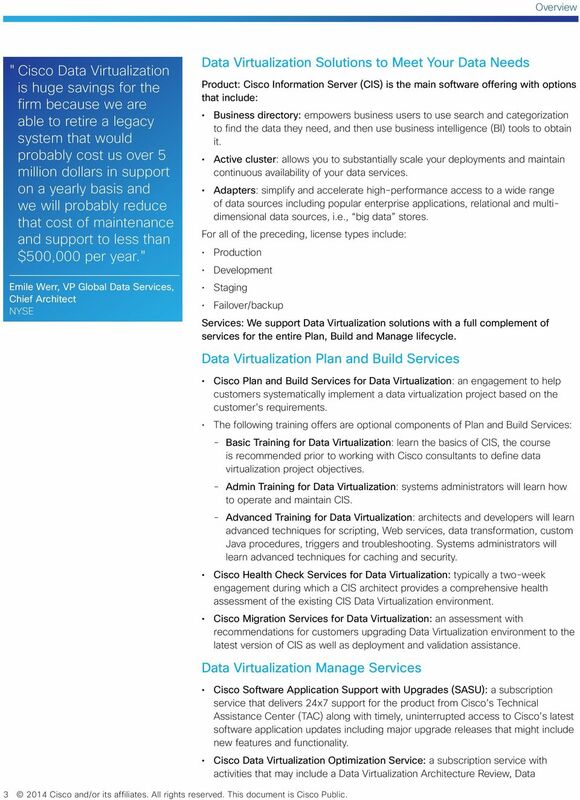 Cisco Data Virtualization Suite Cisco and/or its affiliates. All rights reserved. This document is Cisco Public. 4 "With Data Virtualization, the data gathering cycles for Play-Station 3 system usage were dramatically reduced to daily updates, and the ability to add sources of information for marketing analytics yielded revenue increase of $9M." Anand Rao, Director, Data & Analytic Services Sony Entertainment Network Virtualization Site and Systems Administration, Data Virtualization Health Check, Data Virtualization Upgrade Assessment/Support, On Site Residency and Quarterly Business Review. Technical Account Manager (TAM): a dedicated technical manager to help you achieve operational excellence in your data virtualization environment. A TAM is an expert in data virtualization solutions, data center technologies, and other related IT areas. He or she works with you to develop a customized support plan, perform system-level technical assessments, and make other technical recommendations. Cisco Data Virtualization software enables you to: Install Develop Start quickly and scale successfully using existing infrastructure. Use Data Virtualization's rich data analysis, design, and development tools to build your business views. Business users can easily access the business views through a user friendly directory of business data. Run Data Virtualization's high-performance query engine accesses data sources and delivers the exact information needed through reports and dashboards. Manage Data Virtualization's management, monitoring, security, and governance functions make sure of security, reliability, and scalability. Use automation tools to simplify migration or promotion of configurations and settings across large data virtualization environments and minimize deployment risks. Grow, Innovate, and Lead with Data Virtualization Better business decisions: Gain more business insights by using all your data. Empower your people with instant access to all the data they want, the way they want it. Greater agility: Respond more quickly to your ever changing analytics and business intelligence data requirements. Data Virtualization can provide 5 to 10 times faster time to solution than traditional data integration. Reduced costs: Save 50 to 75 percent by eliminating data replication. Through data consolidation, Data Virtualization allows you to increase utilization of existing server and storage investments. Data Virtualization s simplified approach reduces complexity and saves money. Improved IT effectiveness: The Cisco Data Virtualization Suite has an easy to use interface so your IT staff can increase its productivity and efficiency and develop customized business views of data Cisco and/or its affiliates. All rights reserved. 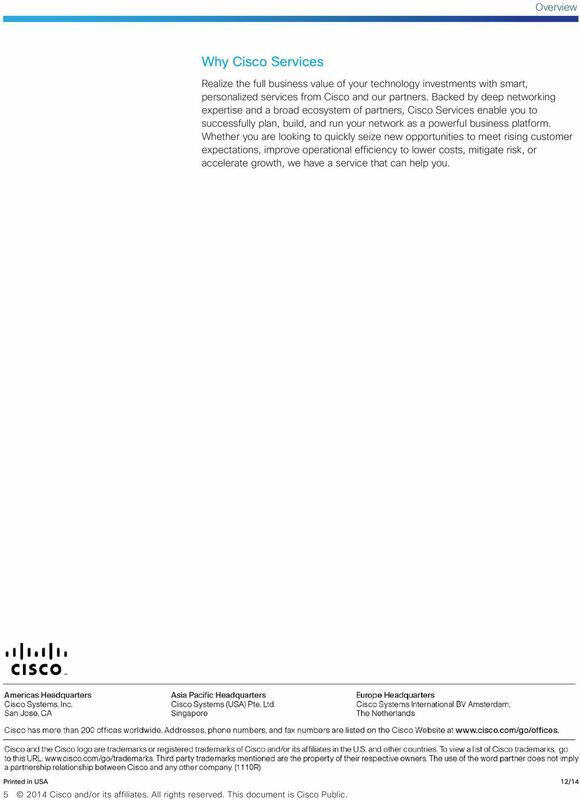 This document is Cisco Public. 5 Why Cisco Services Realize the full business value of your technology investments with smart, personalized services from Cisco and our partners. Backed by deep networking expertise and a broad ecosystem of partners, Cisco Services enable you to successfully plan, build, and run your network as a powerful business platform. Whether you are looking to quickly seize new opportunities to meet rising customer expectations, improve operational efficiency to lower costs, mitigate risk, or accelerate growth, we have a service that can help you. "The Cisco Data Virtualization solution made possible the strategy of virtually keeping all data in one place, resulting in a 30-month projects being completed in 18 months, and business productivity increase." Anestacio Rios, Project Lead Chevron "Cisco Data Virtualization is huge savings for the firm because we are able to retire a legacy system that would probably cost us over 5 million dollars in support on a yearly basis and we will probably reduce that cost of maintenance and support to less than $500,000 per year." Emile Werr, VP Global Data Services, Chief Architect NYSE "With Data Virtualization, the data gathering cycles for Play-Station 3 system usage were dramatically reduced to daily updates, and the ability to add sources of information for marketing analytics yielded revenue increase of $9M." Anand Rao, Director, Data & Analytic Services Sony Entertainment Network Printed in USA 12/ Cisco and/or its affiliates. All rights reserved. This document is Cisco Public. Grab some coffee and enjoy the pre-show banter before the top of the hour! DATASHEET PULSE SECURE CARE PLUS SERVICES Service Overview In today s dynamic marketplace, organizations are under constant pressure to meet market demand while maintaining or increasing return on investment. 12090c 12090c. Is Cloud the way forward for Manufacturing Industries?